WASHINGTON, D.C. (July 14, 2016) — Today, Iraq and Afghanistan Veterans of America (IAVA), the leading voice for post-9/11 veterans and their families, celebrates the courage of U.S. Senator Kelly Ayotte (R-N.H.) to block attempts on the Senate floor to pass the so-called “Veterans First” Act. The proposed Act includes $3.4 billion in cuts to the Post-9/11 GI Bill over the next five years, hurting military recruiting, retention and morale. IAVA, which led the passage of the Post-9/11 GI Bill in 2008, has focused national attention on congressional attempts to cut the earned veteran benefit. Since IAVA launched the #DefendTheGIBill campaign in February 2016, IAVA members have sent more than 31,000 messages to Congress asking them to take a stand and opposed any cuts to the Post-9/11 GI Bill and promise to never use veterans’ benefits as a piggy bank. We call on the rest of our US Senators, the President and Mr. Trump to stand with us to block these cuts. “When our country was attacked, our men and women in uniform voluntarily stepped up to defend this nation, and we should not be cutting the post-9/11 GI Bill benefits they have earned. Unfortunately, while there are worthy aspects to this legislation, the Veterans First Act will make cuts to our veterans’ housing allowance, so I strongly oppose the bill moving forward in its current form,” said Senator Kelly Ayotte. 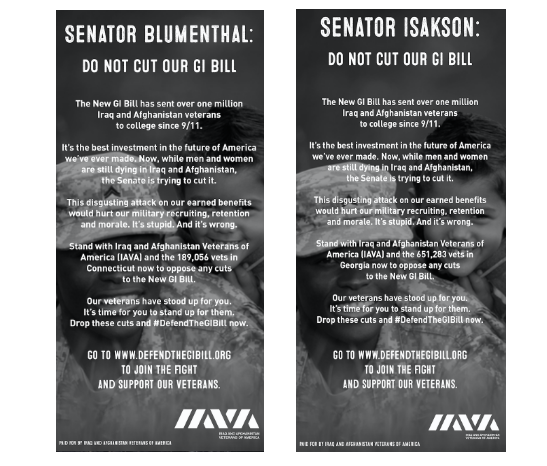 On Wednesday, IAVA escalated its defense of the GI Bill by launching an ad campaign in Connecticut and Georgia targeting Chairman Johnny Isakson (R-GA) and Ranking Member Richard Blumenthal (D-CT), leaders of the Senate Veterans Affairs Committee. Today is a victory in a key battle to defend the GI Bill, but IAVA’s fight won’t over and our members won’t be satisfied until Chairman Isakson announces the cuts have been removed entirely. The Post-9/11 GI Bill has been used by nearly one million veterans and their family members to accomplish educational goals and chart new career paths. For more information about IAVA’s campaign to defend the GI Bill, visit: DefendTheGIBill.org.